Close up of the ceremony arch. 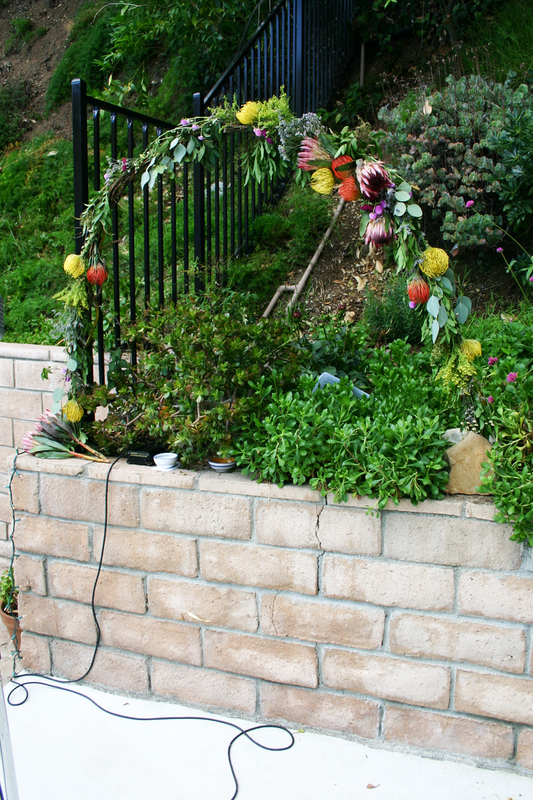 A wild assortment of flowers including protea, eucalyptus, and clover. Last summer, I tried my hand at professional party planning for a few friends who were getting hitched and the end result was just lovely. They wanted something very small and casual, with an emphasis on great food and lots of booze. Since it was only about 50 people, they asked me if I could handle it all, from planning to catering to flowers…so basically, it was my dream come true! While we did do our own wedding, it’s definitely more fun to be the person on the outside making everything perfect for someone else. 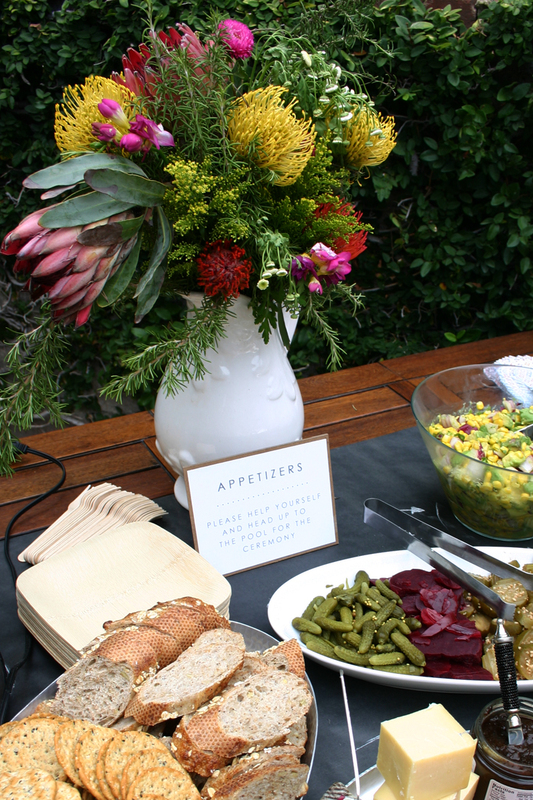 More photos of the food and flowers after the jump. 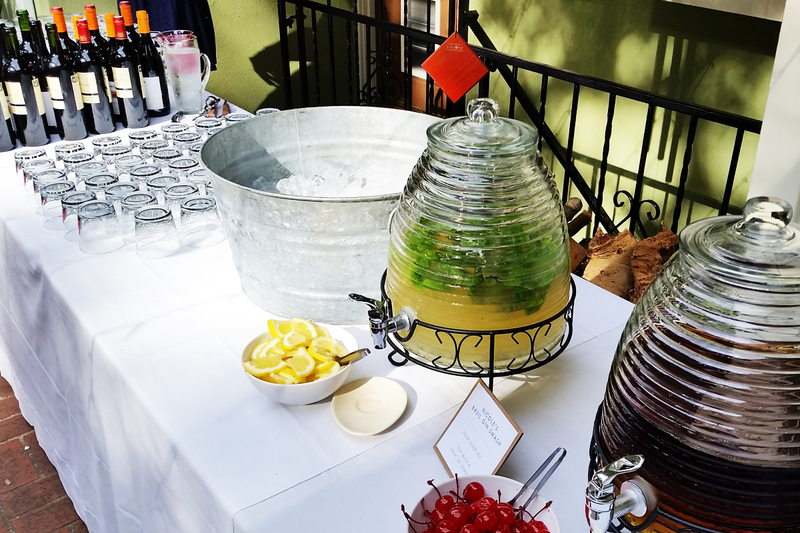 As guests entered the backyard, there was a self-serve champagne, cocktail and wine table. If you narrow drinks down to wine and two pre-mixed cocktails, you can definitely skip hiring a bartender. Just make sure to have everything on the table that someone might need to make their drink and open bottles. We had two simple cocktails named for each bride with instructions on how to finish them off. 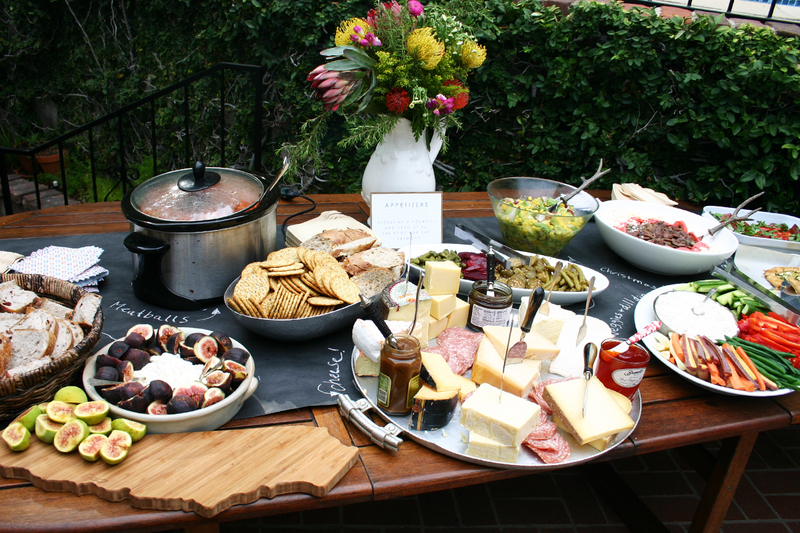 The next stop for guests was the appetizer table filled with elegant yet rustic self-serve dishes. 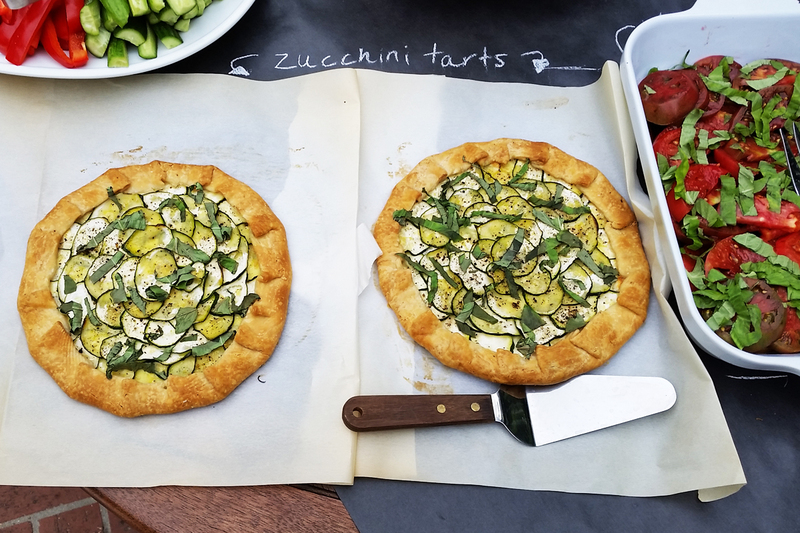 I laid the zucchini tarts out on the parchment paper they were baked on to keep the presentation casual. 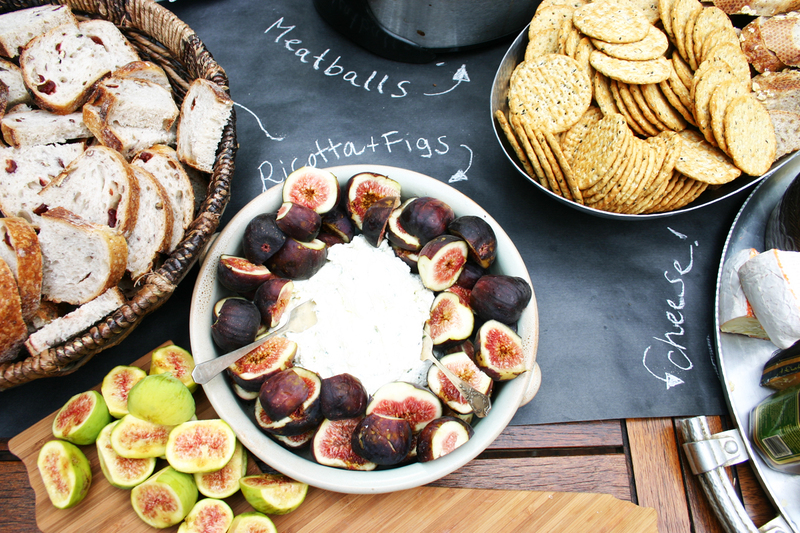 Black kraft paper works perfectly as a chalkboard for labeling your dishes! 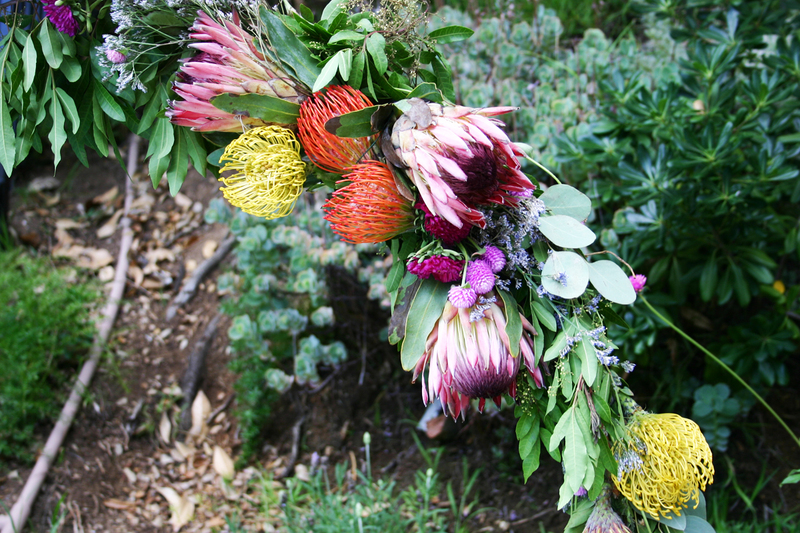 I mixed protea with unfussy wildflowers and even herbs to create wild, unstructured floral arrangements that were very affordable. 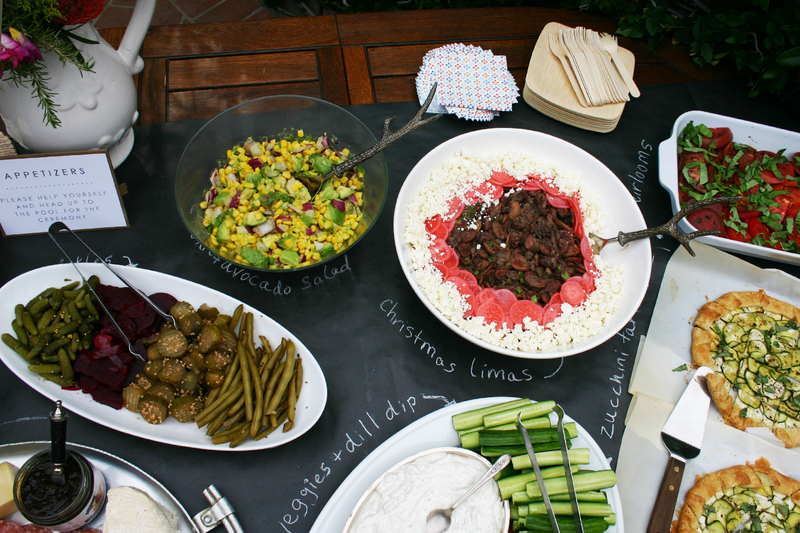 Since it was hot outside, mixing cold salads and crispy pickles with a few warm appetizers was essential for balance and timing. 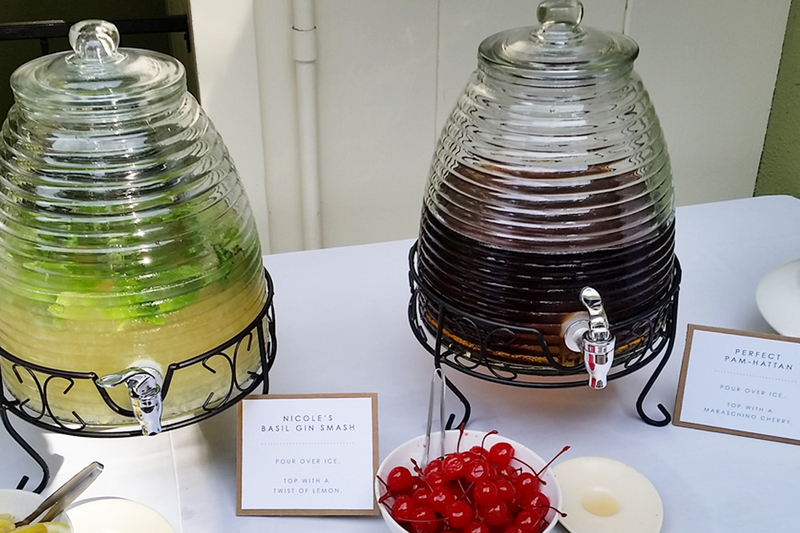 With appetizers and drinks in hand, guests went up to the ceremony location to eat and talk at tall cocktail tables. 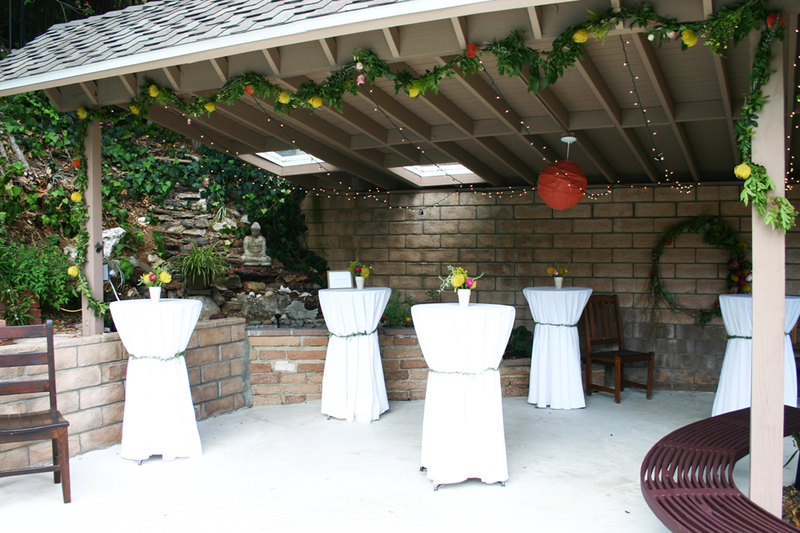 The awning was draped with a garland that I wired together from tree branches (free! ), rosemary (also free!) and protea. 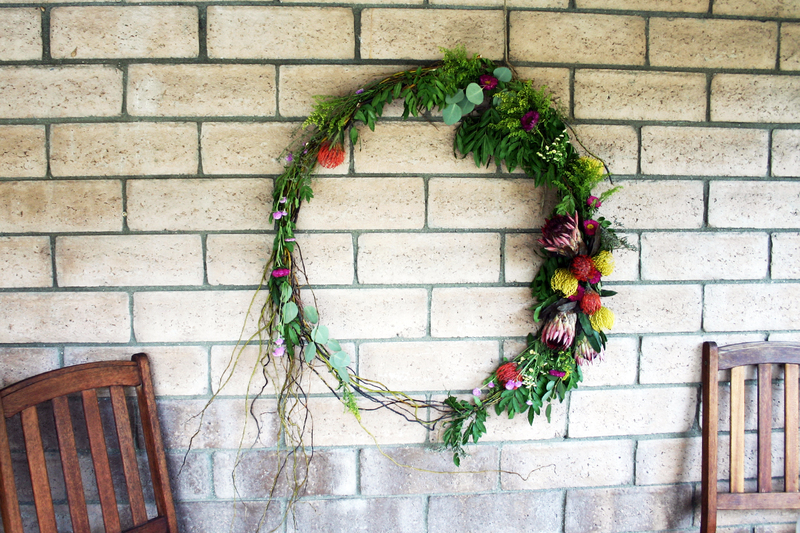 I made one giant floral and grapevine wreath to anchor the back wall of the outdoor space. 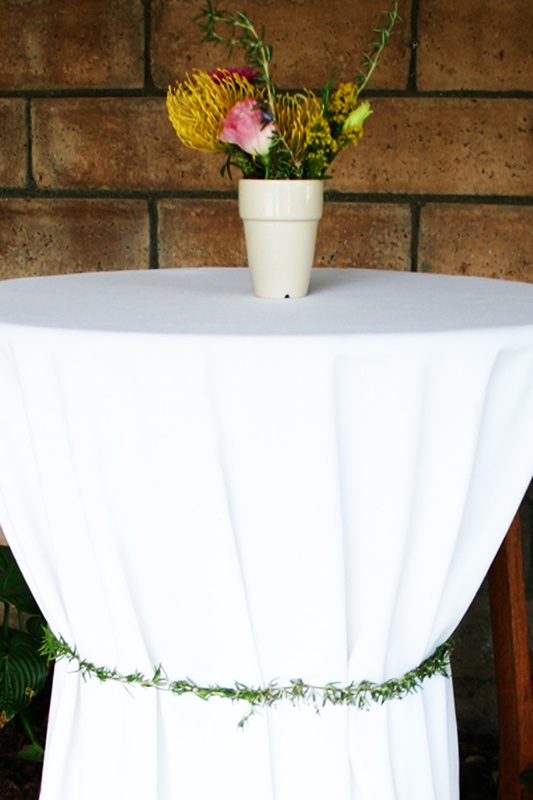 I tied each table skirt loosely with rosemary garlands instead of ribbon to keep them tidy and neat. The ceremony took place in front of a floral arch I made from grapevines and flowers. 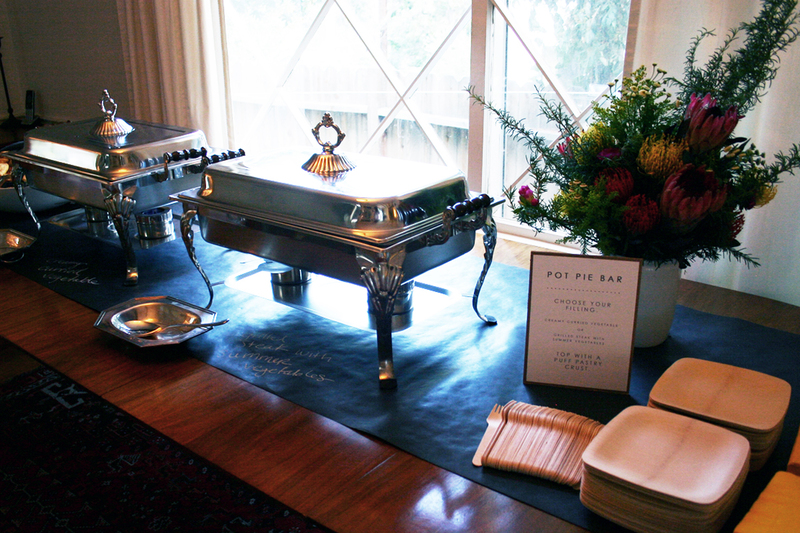 After the ceremony, we had a pot pie bar set up inside. The guests picked a filling and then topped it with a crispy puff pastry square. We used bamboo plates and forks throughout the whole party since there wasn’t a sit down dinner. The bamboo elevates disposable plates and forks to something a little more elegant. 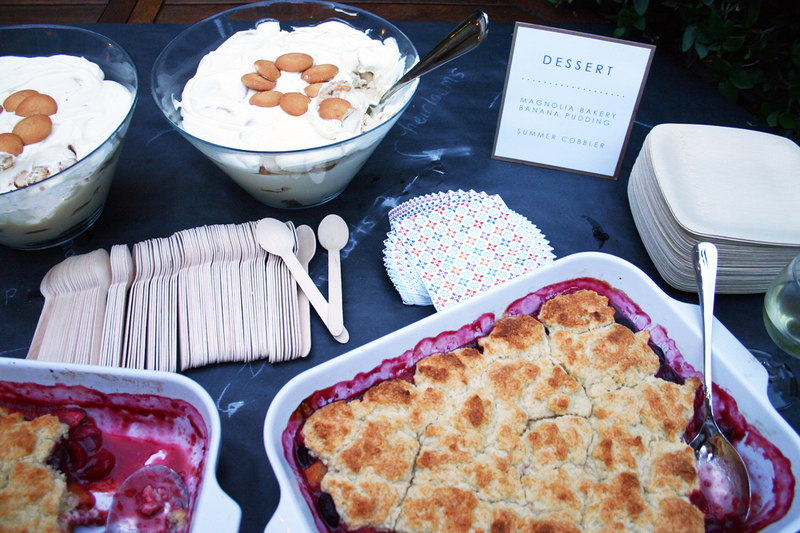 While everyone filled up on dinner, we set up dessert back outside to keep the flow moving throughout the space. 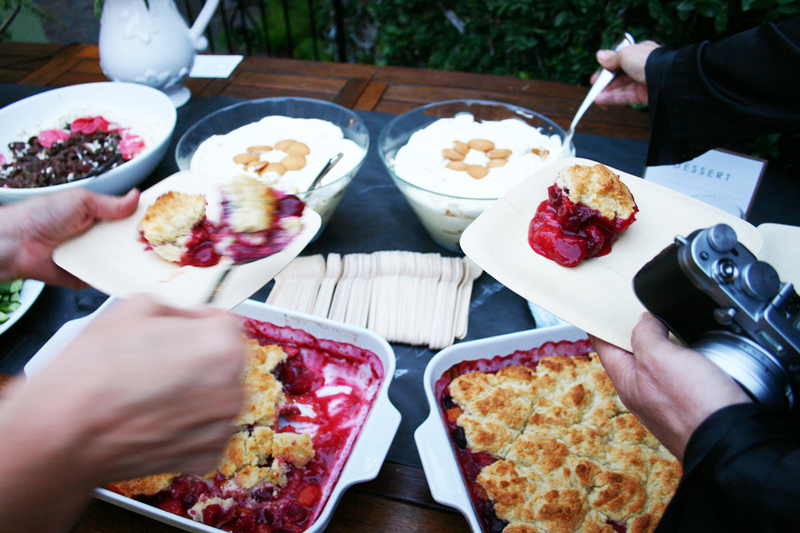 I made a seasonal summer cobbler and Magnolia Bakery banana pudding. Another shot of dessert…because it was just SO delicious! Here’s me with my “staff”! 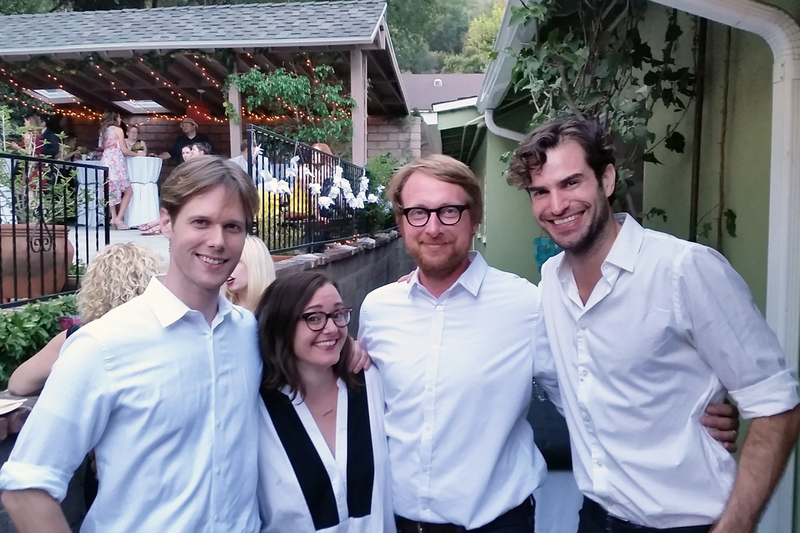 When in doubt, hire your handsome friends and partner to back you up. Oh, such a beautiful party! I would have loved to have been there, to have been taken care of from the moment I arrived – even BEFORE the ceremony – what fun! And your emphasis on the natural and the simply elegant – so lovely. Rosemary table ribbons? Yes, please! The food looks amazing, and I think your “floral” arrangements, wreaths, garlands, arches, are just stunning. So beautiful and simple and unusual. Bravo.